Since he acquired the "Domaine des Mouilles", this young winemaker has always focused his energy on innovation. He updated the family equipment, increased the acreage of the domain, and steadily raised the volume sold to wine lovers directly from the domain. He has always some new projects in mind. Until he was 20, Laurent Perrachon, son and grand-son of winemakers, was spending more time on the rugby field than in the vineyard. Since becoming winemaker himself in 1988, Laurent had to drop the rugby ball to focus on his trade. Before starting to work with his father, Jacques, Laurent took the time to see the world of winemaking. He worked at Château Ausone where he completed his internship after finishing his schooling; then he worked as a bar tender in the UK, in a wine bar. Finally he travelled to vineyards in South Africa and California. "It is mind opening to look at what others do in different places. I am curious and ready to adopt new ideas"
Indeed, when choosing to follow the family tradition, Laurent has not decided to stand still, quite the opposite. Every year, he invests in new equipment, in improving the cellars, and adding new parcels to the domain. Today, after having added Chenas Fleurie and Saint-Amour, Laurent manages a total surface of 23 hectares. On the Bridge every day ! Two workers are with him full time, and a third one part time, in addition to his wife Martine and the occasional help from his teenager children. If he invests half of his time in the vineyard, practicing sustainable winemaking, and without ever stopping to innovate — 2/3 of the vineyard has a reduced vine density and yield by removing one rank every 6 — Laurent spend more and more time to promote his wines. His method? Consolidated shipments to individual winemakers, and multiple events like open doors at the domain and in farms and B&B in France, and personal deliveries to strengthen the links with his customers. The result is showing with 70 % of sales in bottles from the domain and not a free week-end between the harvest and the end of December. 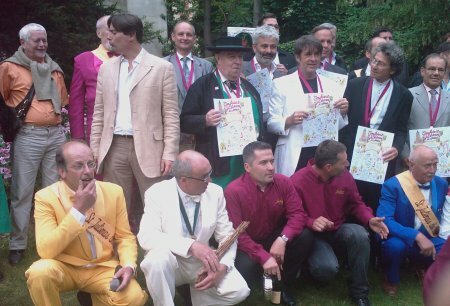 In his forties, with 4 children Laurent is not complaining: "It is a pleasure to speak about my wines. In any case, this is business. When I was a small child, I enjoyed the ambiance of farmer's markets"..
Those who buy at the cellar are mainly private wine lovers from France (70%) or neighboring countries like Belgium, the UK or Denmark. They enjoy a collection of wines with their strong personality, such as long macerations, giving solid wines. Some are then aged in oak barrels and can age surprisingly well for Beaujolais. The Domain is Notamment après élevage en futs, pour une partie d'entre eux. Laurent is exporting to places as far as the USA, Canada and Japan. Not only is Laurent managing the domain with Martine, but he is also active with local associations. 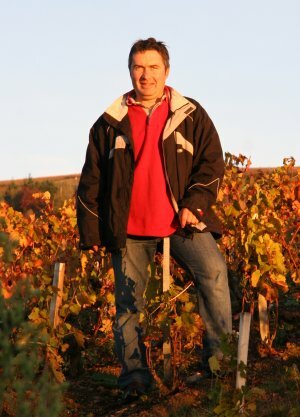 He is the president of the Julienas Appellation, which give him additional responsibilities to defend the wine appellation and the trade, and participate to promotional activities like the Juliénales, at the end of July, or the twinning with Saint Germain des Prés, where a few Julienas vines are growing, under the patronage of famous artists. When Laurent can take a rare break, he likes to discover other wines in degustation clubs, discover a new restaurant, or broaden his collection of wines, French or foreign. If he can, he goes to Saint-Claude, in the Jura, his "second villlage" where he was going on vacation as a child.